Anyone looking for information on your conference will start by looking up for your website in a search engine. Your website is a major promotional tool and will help you establish credibility and showcase your event. Plus, it can save you loads of time: instead of having to answer the same questions over and over through individual emails, you can use your website as a portal where users can submit, register, and find all the details about how to get involved it your conference. That’s why it’s so important to have a good website up and running as soon as possible. So how to build it, and where to start? Here are eight steps to an effective website for your conference. Its complexity. How many pages will it contain? Will you need built-in features like registration? Are you happy with a classic but efficient design or do you want a one-of-a-kind design? Who is going to build it. Are you going to work with a design agency or do you have somebody who can build it within your team? If you’re starting from scratch or if you already have a design and a structure that works well and you just need to update the info. Taking all these elements into account, set the main deadlines of the project. Keep in mind that you won’t have full control over all of them, especially if you’re hiring someone to do the job. Don’t underestimate the amount of work you’ll have to do either. Gathering information, writing content and liaising with all the stakeholders is time-consuming. Set realistic deadlines and allow for enough flexibility. On average, it takes about 12 to 16 weeks for a design agency to create a custom website. Before you start diving into the specifics of how your website should look, you need to set a budget. How much money you can spend in designing and developing the website? This will have a big impact on what you can do and what you’ll get. It will determine if you can hire a web agency or not, if you can afford a bespoke design and the type of solution you can use. Building a website doesn’t have to cost a fortune. Some great and free tools exist, and you can get a simple but efficient website for less than €150. Now that you got the nuts and bolts covered, let’s get down to the specifics. The first step is to define what will be the structure of your website. To figure this out, step into your visitors’ shoes and list all the actions you want them to take: registering for the conference, submitting an abstract, contacting you… Always tie these actions to the visitors’ needs. What’s the problem they are trying to solve? What information are they looking for? What questions do they have? 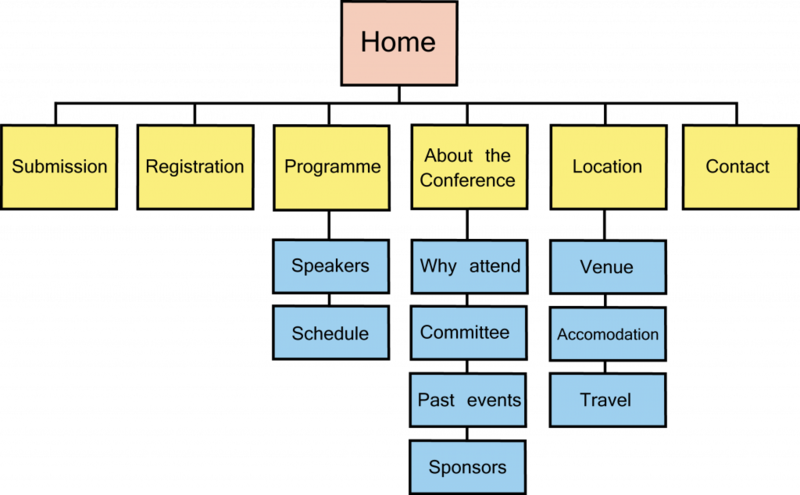 Make sure you consider all the different types of visitors: authors, delegates, sponsors, etc. Then map out the path you want your visitors to take i.e. the set of actions that will lead them from a landing page to the final action. A typical delegate’s path could be : Homepage > How to attend page> Registration page > Registration form > Confirmation page with a Share on Twitter button. After this exercise, you should have the list of all the information and pages you need on your website and the journey you want users to take. You can now map out the website structure. Kissmetrics gave some good tips about how to create a powerful site structure. It should be logical and simple: no more than seven main categories. Make sure that the most important pages of your website are easy to find. Your site hierarchy will dictate your navigation structure. Once you outline the path you want your visitors to take and the pages you’ll need to build, you can start working on the website content. You should write your copy first and then decide on the look and feel of your site is. This will ensure your design will serve your content and not the other way around. Your copy should be clear and to the point. Headings, bullet points and visuals will improve the reading experience. Keep Search Engine Optimisation (SEO) in mind. SEO is what ensures that your website ranks well in search engine i.e. that people find you easily when looking up for your website. SEO is quite complex and takes time to master, but there are some easy things you can do. We won’t go into more details in this article, but you’ll find some great tips in MOZ’s Guide to SEO for beginners. Now comes the big question: how will you get your website designed and developed? The answer highly depends on the deadlines and the budget you set and on how complex you need it to be. There are some great solutions out there to design simple and cost-effective websites. One of the best is WordPress. This DIY tool will allow you to build a website and manage all the content easily. We wrote an article to show you how to build a cost-effective website with WordPress. Another solution is to hire a design agency to build the website from scratch. This is a more expensive option, which might also take more time, but you’ll be able to get a more complex website. Wireframing is an essential step in designing a website. Depending on the solution you use to build your website, you might do it yourself or ask the agency to do it. 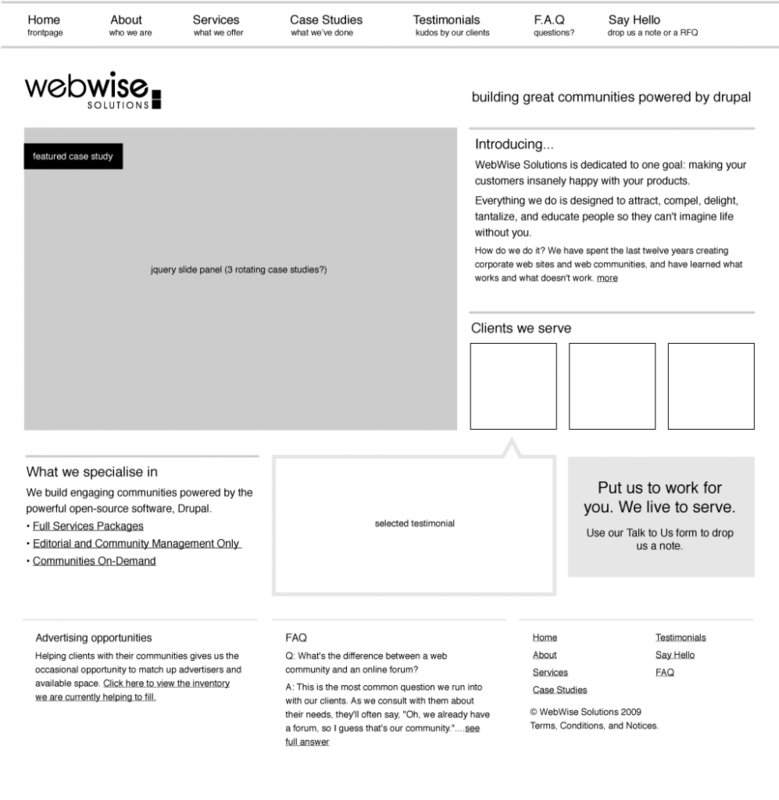 A wireframe is a visual display of the information hierarchy. It’s the backbone of your design. Wireframes help you focus on functionality and user experience. They are simple black and white layouts outlining where the different elements on your pages should be placed. Wireframes contain titles, text, images, buttons (call to actions) and any important elements you need to include. If you work with an agency or a designer, wireframes are a great way to clarify your expectations and ensure that you’re on the same page and share the same vision. You can use proper wireframing tools (Balsamiq is a good option) or you can also just sketch on a piece of paper or a whiteboard. Once you know where all the main elements of your website should go, it’s time to dress up your website, to give it a personality, color and style. Keep it simple; functionality should always come first. It should look professional to ensure credibility. Make sure the design reflects the tone of your conference. Click here for some inspiration. Don’t forget to choose and buy a domain for your website. Make sure you take into account how long the website will be live for when you are buying your domain and arranging hosting. What will happen to the site afterwards? Congratulations, your website is up and running! Now you need to attract visitors. There are several things you can do to drive traffic to your website. SEO: to stand out amongst all the conferences in your field, focus on the keywords that will attract relevant visitors and help you. Email: a great way to keep your community informed on what’s happening with your conference and to nurture relationships. Social media: use Twitter and Linkedin to spread the word about your conference and to keep your community in the loop. Blog: provide interesting content on your conference and on your industry to drive more traffic to your site. Network: Word of mouth is a powerful thing. Encourage authors, reviewers and delegates to recommend your conference to their peers. Paid Advertising Campaigns: try paying for ads on search engines. Some of these strategies will be easier to implement than others. Pick the strategies that seem more relevant to your conference and that will appeal to your delegates. Building a website might look like a daunting challenge for someone who has never done it and the truth is, it can be! But it doesn’t have to be. You can just decide to go with a simple website. As long as it answers all your visitors’ questions and it makes it easy for them to do what they need to do, a simple website can be as efficient as a sophisticated one. Download our conference planning ebook to get more details on all the milestones of planning your conference.